Kathryn Kerby-Fulton, professor of English at the University of Notre Dame, has received the 2010 Haskins Gold Medal from the Medieval Academy of America for her work, “Books Under Suspicion: Censorship and Tolerance of Revelatory Writing in Late Medieval England.” This award is given annually to a book, published in the previous six years, that is judged to be distinguished in the field of Medieval studies. 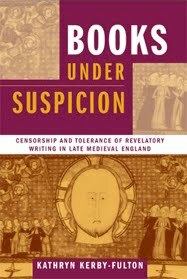 “Books Under Suspicion,” published by University of Notre Dame Press, explores censorship and tolerance of controversial revelatory theology in England from 1329 to 1437, suggesting that writers and translators as different as Chaucer, Langland, Julian of Norwich, “M.N,” and Margery Kempe positioned their work to take advantage of the tacit toleration that both religious and secular authorities extended to this type of writing. Kerby-Fulton makes use of neglected material in manuscripts and archives to construct an acclaimed revisionist account of theological politics in late medieval England and academic freedom in universities of the time. A member of the Department of English faculty at Notre Dame since 2005, Kerby-Fulton also is affiliated with the College of Arts and Letter’s Medieval Institute. “Books Under Suspicion” also was awarded the John Ben Snow Prize from the American Conference on British Studies in 2007. That prize is awarded annually for the best book by a North American scholar in any field of British Studies dealing with the period from the Middle Ages through the 18th century. Kerby-Fulton specializes in Middle English literature and related areas of medieval studies. She has written several books and articles on medieval literary writers, including “Reformist Apocalypticism and Piers Plowman.” Her edited collections include “Written Work: Langland, Labour and Authorship with Steven Justice; Iconography and the Professional Reader: The Politics of Book Production in the Douce Piers Plowman” with Denise Despres; and “Voices in Dialogue: Reading Women in the Middle Ages” with Linda Olson.